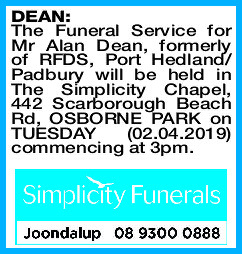 The Funeral Service for Mr Alan Dean, formerly of RFDS, Port Hedland/ Padbury will be held in The Simplicity Chapel, 442 Scarborough Beach Rd, OSBORNE PARK on TUESDAY (02.04.2019) commencing at 3pm. 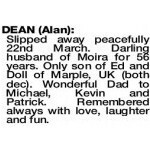 DEAN ALAN Slipped away peacefully 22nd March. Darling husband of Moira for 56 years. Only son of Ed and Doll of Marple, UK (both dec). Wonderful Dad to Michael, Kevin and Patrick. Remembered always with love, laughter and fun. Hey Dad, rest easy. You were always there for all of us. 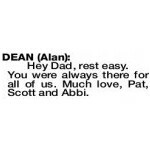 Much love, Pat, Scott and Abbi. 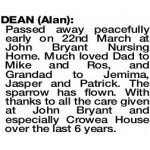 DEAN ALAN Passed away peacefully early on 22nd March at John Bryant Nursing Home. Much loved Dad to Mike and Ros, and Grandad to Jemima, Jasper and Patrick. The sparrow has flown. 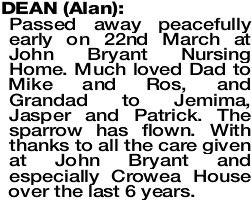 With thanks to all the care given at John Bryant and especially Crowea House over the last 6 years. Deepest sympathy to Moira, Michael, Kevin, Patrick and families. 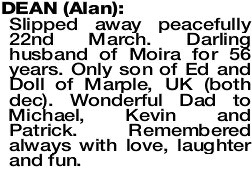 Alan is now at peace. Remembering happy days we had in Hedland.